Leaford James is a Jamaican fashion designer who resides in Houston, Texas. Leaford realized early in life that fashion design was his love and appreciation where he designed and made his first outfit for his sister in high school. Leaford came to the United States in 1976 attending university only to be postponed to serve time in the Marines. Not until Leaford traveled to Los Angeles, did he focus more on his fashion designing by attending and earning is degree from Trade Technical University School of Fashion Design. While in Los Angeles, Leaford worked with Ramsey’s Tailoring and Frederick’s Cleaners for further tutelage in his craft. 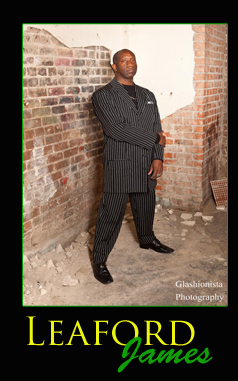 In 1993, Leaford traveled to Philadelphia to start his own fashion design and dry cleaning business where he was successful. Leaford eventually left Philadelphia for Houston in 2005. Since being in Houston, Leaford has been working on establishing his fashion career and manufacturing business here in Houston. Leaford James Collections presents suits, skirt, vest, pant, jacket and dresses. His speciality being denim fabric.